Content warning: This article contains references to sexual harassment and assault. Fall 2018 marked one year of paid leave — over $100,000 — for tenured UC Santa Cruz history of consciousness professor Gopal Balakrishnan. Balakrishnan began teaching at UCSC in 2006 and has numerous allegations of sexual assault and faculty misconduct against him from throughout his time at the school. A Title IX investigation concluded in September 2018 found him to to have violated the UC Policy on Sexual Harassment. Despite the conclusion of the Title IX investigation, Balakrishnan entered his second year of leave and continues to collect his salary. The disciplinary action process is underway, but survivors and allies are growing impatient with the process. October 8, 2018: Survivors and allies support Anneliese Harlander as she reads the letter she planned to present to Campus Provost/Executive Vice Chancellor Marlene Tromp. Photo by Lluvia Moreno. Harlander is the complainant in the Title IX investigation that found Balakrishnan responsible for allegations of sexual harassment, but she wasn’t the first person to accuse him of sexual harassment or assault. She came forward in winter 2018, when Balakrishnan was already on paid leave, after reading an open letter detailing multiple allegations of misconduct and sexual assault against Balakrishnan. The Title IX investigation concluded that in 2013, when Harlander was a student, Balakrishnan engaged in unwanted sexual conduct with her after a student party they both attended. Throughout the investigation, Balakrishnan denied all allegations against him through his counsel, Jamie Dupree. After the investigation conclusion, Dupree declined to comment further. Following the conclusion, as per UC policy, the case was forwarded to the Office of the Executive Vice Chancellor (EVC), where EVC Marlene Tromp decided to pursue disciplinary action. In mid-November, Tromp sent Harlander a letter updating her on the process. It said Tromp had initiated disciplinary action and a hearing before the Academic Senate may be held. 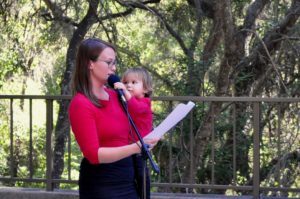 “We continue to be moving through the procedures for the disciplinary process pursuant to the required personnel procedures,” said UCSC director of media and relations Scott Hernandez-Jason in an email. He could not provide further specifics of this case at time of press. According to the UCSC investigation and adjudication model, Balakrishnan could agree to the proposed discipline, resulting in an early resolution. If he does not agree to it, Tromp will file the notice of charges and proposed disciplinary action with the Academic Senate Privilege and Tenure Committee. The committee would then hold a hearing and make a disciplinary recommendation to the chancellor. If the Senate recommends the termination of Balakrishnan’s position at the university and the chancellor agrees, the final decision rests with the Board of Regents and UC President Janet Napolitano. Harlander said she is grateful the school is pursuing disciplinary action, but the process needs to be expedited. Harlander considers this to be a rare and egregious case and believes the UC should suspend Balakrishnan’s pay while permanent disciplinary action is decided on.